Patellar luxation is a common dog health problem with small dog breeds. However, big dogs can have this condition too. Luxation means to be out of place, to dislocate. Patella means kneecap. 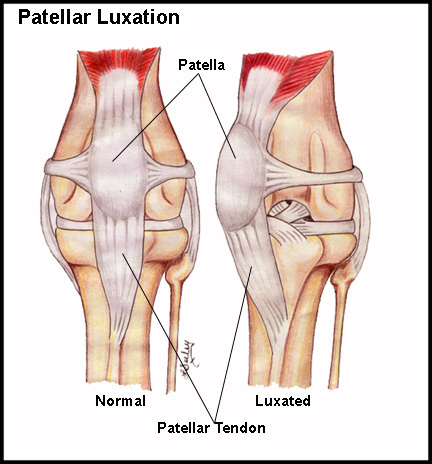 So, patellar luxation means, knee caps out of place, kneecaps not in the correct position. In this picture, the leg on the left clearly shows a kneecap securely in it's groove, firmly held in place by the ligaments. You can see from looking at the diagram on the right, that the knee cap has slipped out of it's correct placement in the middle, and has now ' floated ' to the left. This is not OK.
A floating kneecap means that the kneecap will not stay securely in it's groove. It either slips to the outside ( lateral ), or the inside (medial ) of the leg. You can well imagine that this would HURT! OUCH! This condition is graded according to how easily the kneecap slips back into place. Sometimes the kneecap will just pop back into it's groove, on it's own. If this happens, the dog will just carry on as if nothing has happened. Sometimes the kneecap slips out, but it will easily slip back in, with a little bit of manual help. Sometimes the kneecap just wont stay in place and so is out of position most of the time. You can put it back in, but it won't stay that way for very long before it pops back out again. Sometimes this loose knee cap will not stay in place, no matter how many times it is repositioned. This is the most serious case. The dog will not be able to put his weight on it. So it is easy to see that if the kneecap continues to slip out of place, ultimately the ligaments holding the kneecap become stretched, strained and perhaps even damaged and torn. This will cause serious instability in that leg. The dog will be reluctant to use the leg because it HURTS, and so will carry it up. Your dog may even overcompensate then, by using the other leg more. This can strain the good leg too, and ultimately create an ACL tear in the good leg. So what's to be done about this type of dog knee injury? Keep your dog's weight down. Less weight means less for his joints to carry. Strive toward a healthy body weight with more lean muscle and less fat. No fat dogs please! Take your dog for a walk. Exercise will keep his muscles strong and help keep his weight down. Walking is good for you too. 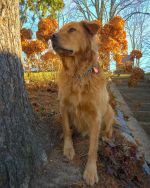 A correct raw food diet consisting of meat, bones and organs will supply the dog nutrition needed to build strong muscles, ligaments, bones and supporting tissue for joints. Use nutritional health supplements for joint support to build strong connective tissue and ligaments. Strong ligaments will keep your dog's knee caps properly in the groove. Diet is critically important as part of a program to repair and improve structural issues in dogs. Carbohydrates are foods that create tissue inflammation. Dogs as carnivores, thrive on a diet of meat, bones and organs. It is from the connective tissue of other prey animals, that strength is obtained and utilized for the purpose of building strong structure. I can't emphasize this enough.